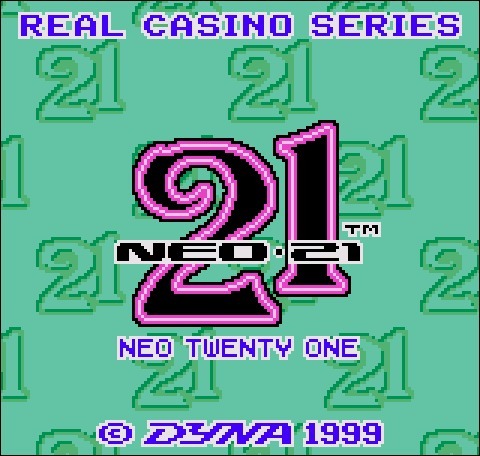 Neo 21 is neither more nor less than a BlackJack simulation on Neo Geo Pocket. The system also hosted a bunch of casino games, including an impressive amount of different Slot Machines, the classic game of Poker and a dozen of Pachinko games that encountered great success in Japan. Here, the Neo 21 is simply a table where you play blackjack with a nice brunette croupier. Wins are multiplied according to the combinations and in case of consecutive victories, but as you'll have to meet some luck and play smart. It is also possible to increase the bet during the game, once the first card is given... If you like taking risks! When your total is higher than the bank, you win... Let's remind the rules for noobs: Bank distributes cards to the players one by one. These have a value equal to their number: a 4 is worth four points, a 10 ten points. Face cards are worth ten points, while the Ace is worth one or ten points depending on the player's desire. Get as close as possible to 21 without exceeding this value: make a higher score will eliminate you. The player making the highest total without going over 21 wins the pot. Neo 21 is a good way to practice before moving on real gaming tables, and a very nice soft for traveling by train or plane! Neo Twenty-One is an especially suitable software for a handheld console, faithfully recreating BlackJack game. We would have preferred a single cartridge to group all versions of casino games on NGPC (Neo Mystery Bonus, Dragon's Wild Neo Baccarat Neo Cherry Master and so on ...) But Twenty-One is a must-have for card games addicts on SNK's portable system.